An otherwise fantastic game has us debating what's an acceptable level of grind. Tom: Assassin's Creed Odyssey is really good. Steven called it "a remarkably massive RPG held together by a web of satisfying pursuits" in our Assassin's Creed Odyssey review. We have found one sticking point that's worthy of more discussion, however. If you head into the 'Time Savers' section of the in-game store, you can find a permanent 50 percent XP boost that lets you progress through the story faster without having to complete as many of the game's side activities. It costs 1000 Helix credits. A pack containing 1050 Helix credits costs $10/£9. You also get some free credits during the game. Samuel and I both bought it, and for me it solves the biggest problem I have with the game. I played eight hours of Odyssey at a preview event. I noted my struggles to hit the level gate at the end of the demo. Now I'm going through the game again with the XP boost active, and it's a much smoother, more enjoyable experience. I love the story, but I only enjoy some of the sidequests and side activities. In another RPG, like The Witcher 3, the levelling curve is forgiving enough to let me progress at my own pace and pick and choose what I want to do. In Assassin's Creed Odyssey I feel like I can only do that with the permanent 50 percent XP boost. I haven't paid for an asset or a mission. It's ten bucks to tweak a number value. It's the sort of change you might expect to see in a balance patch. I paid for it, so I guess I'm part of the problem, but it feels like a few years ago paying ten bucks for an XP boost in a singleplayer RPG would cause a lot more uproar. That's not to say most people aren't happy with the game's default XP tuning, but it's the kind of microtransaction we're used to seeing in free-to-play MMOs and multiplayer games being slotted into a game that already costs £50. That seems… not cool? Samuel: I agree. Me and Tom both bought this independently of each other when the game launched last week, and for me it's partly in response to Origins, which introduced aggressive level-gating that nudged you towards side activities. By the end of that game I was so done with grinding—I completed the final section under-levelled and in stealth, struggling to take on a single enemy face-to-face, because I wasn't prepared to give the game any more of my time in reaching the recommended level. I otherwise loved Origins, but I felt like I limped to its finale. There's another reason I paid for the XP booster in Odyssey. On PC, you can pay for a temporary 25% XP booster with 10 uPlay coins (the free currency you unlock for completing achievements in Ubisoft games) through the Club rewards option of the menu. I put this on for two hours, and immediately noticed the difference. But you can only use it once. I could breeze through the opening islands without wasting time on as many side activities, focusing on what I believe are higher-quality side quests and main missions. Seven hours into the game, with the paid XP booster, I'm only ticking off the activities I want to do, and having no problem with the level curve. I've generally avoided the mercenary boards and limited time quests. This is the way I want to play. It costs $10/£9 extra. 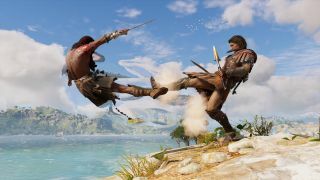 In discussing its issues with the boost last week, Polygon noted "Odyssey feels more like an Assassin's Creed game with this option purchased than it does without". I'm not sure I entirely agree—but the existence of the booster has made me think long and hard about Ubisoft's approach to level-gating. Tom: I don't think the default levelling curve was designed in bad faith; I'm sure the devs would like players to explore all of the activities they have made. But in an open world RPG I value the freedom to not do things I find tedious. The presence of the XP boost does encourage conspiratorial thinking though—is the XP curve tuned to be irritating enough to push people into XP boosts? The problem is that level disparities in both Origins and Odyssey are so punishing that being even one level below your opponents makes the game worse—and I don't mean difficult, I mean it makes the game less fun. It's not hard to press on through a one level deficit, it's just annoying. Enemies take a lot more hits to go down. The pace of the game becomes gruelling. Samuel: This, I think, is the problem: a difference of a few levels in Assassin's Creed doesn't mean an interesting combat challenge like it might in another third-person game. It means a gruelling encounter with skull-labelled enemies who take very little damage, while two of their hits will kill Alexios/Kassandra. Level-gating rules everything in Odyssey. I tried completing one of the larger-scale battles while under-levelled, and I couldn't kill the captains fast enough with my attacks to make the bar go down. I'm good enough at the game to avoid taking damage and survive, but the numbers and the timer dictate my success there, not how good I am at countering or using my abilities. It's this collision of flawed level-gating and microtransactions that inevitably leaves a bit of a sour taste. I'm otherwise really enjoying Odyssey, but it would be with some caveats if I was playing it at Origins' pace. If the XP booster didn't exist, maybe I wouldn't be thinking about the pacing of the game so much. Maybe I'd just get on with the grind without complaining. I've written before about games that do and don't respect your time—the PC release of Final Fantasy 12 includes a fast-forward function that lets you grind through enemies at a crazy speed, and it makes the game tons better than its original PS2 version. But Square Enix didn't charge you extra for it. I spend a lot of time worrying about how much games demand of my time now. This might not be the case for everyone, though: if Odyssey is the one big game you buy this year, maybe the gentle levelling curve represents value for money. It just doesn't to me. I'd rather have those hours back. We discussed Origins' problem with bloat earlier this year, and the thing that solves that issue in Odyssey...is extra money. Tom: A cursory Google of Origins or Odyssey turns up a bunch of ‘how to grind XP' guide pieces, and for me grind shouldn't be a part of a modern singleplayer RPG. My days of farming Cactuar for rare drops are over, and it's a shame to lock off the world behind XP gates and then charge players to access it faster.